This challenge has been so good for me, because I've tried so many new techniques and designs. Today is another first for me. My first ikat nails. And let me tell you now, I love doing ikat designs. These were so fun, quick and easy to create. In fact I was completley finished my full design in under 30 minutes. I also love that it's such a messy design that, in fact you need to be messy to make it look good. You just need a fine nail art brush and the ability to create short lines. Plus, if your top coat smears your polish (like mine did) then it actually enhances your design, rather than ruins it. 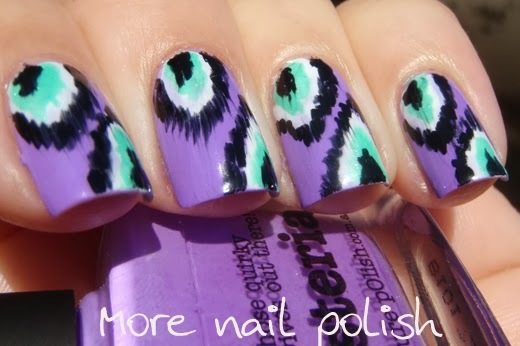 I can see me creating many ikat design nails in many colours. 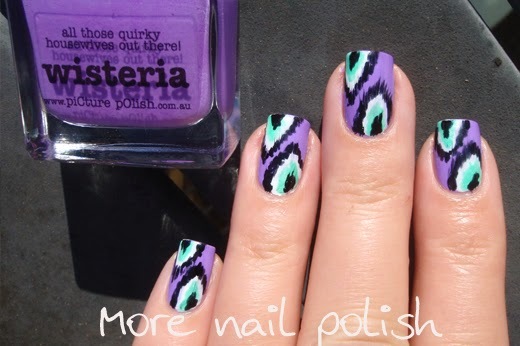 Does anyone know who the first person was that created ikat nails? I'd love to know so I can thank them! I use Picture Polish Wisteria, Jade, Black and Bright white to create this look. I love the combo of purple and aqua.